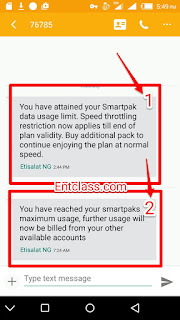 Hello EC readers, the Etisalat socialme (smartpak) tweak which is unlimited before is now data capped. I Victor Kachi personally noticed it. I got 2 texts from Etisalat, stating that i have reached the maximum speed and also i have reached the maximum data usage. I thought it was a joke until i tried to connect with Psiphon, Syphon and Tweakware premium account. All wasn't connecting. I decided to re-sub for the weekly plan by dialing *343*6*10# which goes for N150, after subscribing to the plan, my Psiphon connected in seconds. See below screenshot of the messages i received from Etisalat. After much observations, i noticed Etisalat socialme tweak is now capped about 2GB. It's really disappointing and annoying cos this tweak has been saving us from huge amount of money for just small data subscription that won't last a week. And the most sadden part is that, Etisalat did not give a code to check data balance of socialme as it is now data capped. 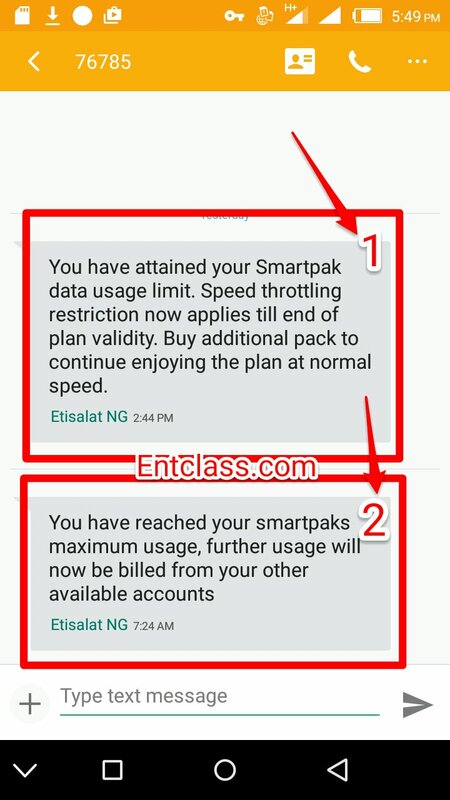 Did you also received such message from Etisalat too? And what's your say about this? Are you very sure your Imei was successfully changed? I think the porting must be the cause. But come to think of it, it supposed to work.